S T A R T H E R E 2 0 1 8 a water washout at all? Do you have a good understanding of the strengths and weak- nesses of all different types of photoresists? So, join me for an interesting, exciting and (hopefully) profitable ride. Start at the Beginning It seems that almost every- one in the recognition business knows that abrasive blasting is the method of choice for etching glass in most situations. The equipment is not expensive and the basic techniques are not hard to learn. It is the fastest method to produce finished pieces and the quality of the work is better than that produced by any other technique. More different effects are possible with abrasive etching, something that will become increas- ingly important for you to know about to be competitive. 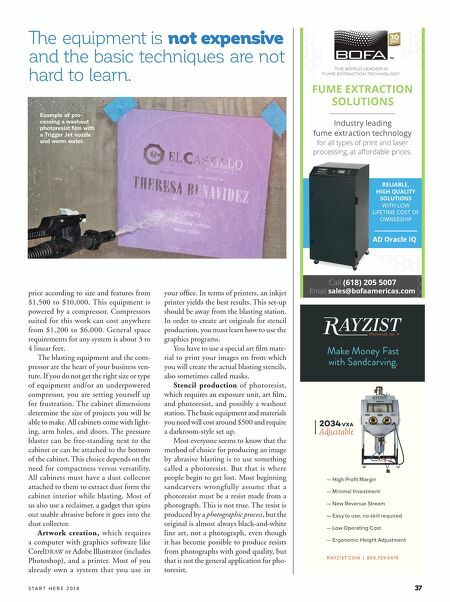 The fact that abrasive blasting can also be used for etching of stone, ceramic, and other substrates is icing on the cake. The components any beginner has to look at that will make up a complete glass etching venue are: Blasting equipment consisting of a cabinet, a pressure blaster, a dust collector, and reclaimer. Blasting systems vary in Ruth Dobbins teaching the basics of photoresist processing to a class of students. Everything makes more sense with hands-on experience. 36 Example of a blasting system with a free-standing pressure pot blaster. 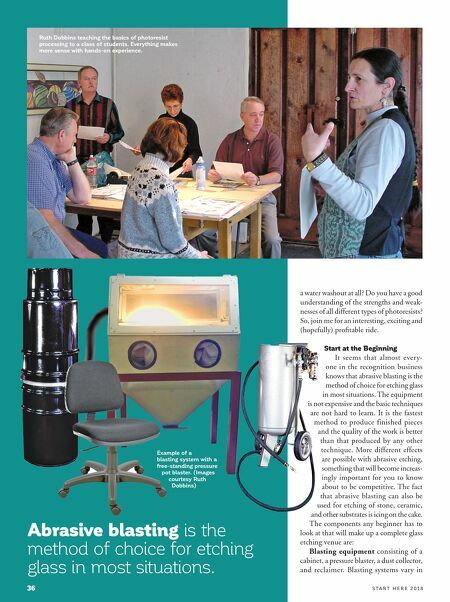 (Images courtesy Ruth Dobbins) Abrasive blasting is the method of choice for etching glass in most situations.